Eyes: bead chain or dumbbell lead.. Weighting can vary according to depths fished. Top flash: Mirage mylar or Krystal Flash. Thread: One pound test bulk spool or Coats and Clark transparent thread. Coloration accents made with colored markers per baitfish in areas. Prepare one inch in length tail by tying together approx. 20 strands of Krystal Flash using mono thread. Spread out 1/2 inch of one end onto flat surface and coat with cement Use two coats. With hook down in vise tie in eyes using figure eight wraps. Tie in body material at hook bend along shank up to and around eyes. With Point down tie in tail on top of shank with slight downward angle. Tie in Fishskin material on top of tail securing down with mono thread.. bring thread up in front of eyes and tie down material over eyes. 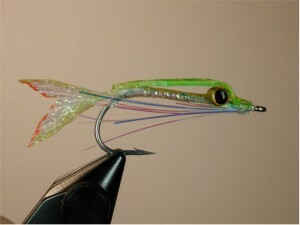 Turn fly over Tie in Krystal flash in a small clump 1/4 inch long behind hook eye with ends facing away from hook eye. take ten wraps then pull Kystal Flash back over itself to the rear. Trim to have flash remain inside of hook bend. Coat entire fly with Loon Hard Head cement. Fly is done. Cast far and hang on !! For over 5 years Terry Baird has been inventing and developing self-swimming flies. His famous Hula Series has been a standby for many species world wide and this new fly takes his self- swimming wiggling methods to new areas.. namely deep. This fly swims in all directions being fished and even swims on the drop.. something very uniquely desired by deep water fisherman. This pattern and others are available on a very limited basis from time to time.. Please inquire as to availability. Back orders will be taken.